Work to improve and extend Hull Royal Infirmary’s Emergency Department (ED) is continuing at pace as the winter months approach. Hull and East Yorkshire Hospitals NHS Trust’s £8m ED improvement project has already delivered a new adult ‘Minors’ area, where non-life threatening cases are dealt with, and a new Children’s Emergency Department which opened in May this year. Now work on the ‘Majors’ area of the ED, where the most critically ill patients are assessed and treated, is progressing rapidly and four brand new resuscitation rooms will be brought into use today. Doctors and nurses working in the current Majors area will move out of the hospital and into temporary, modular accommodation to the rear of the tower block whilst refurbishment work continues. Once complete, the ED will have doubled in size to approximately 3000 square metres and the total number of resus bays will stand at 10, making it one of the largest resuscitation departments in the country. The temporary decant of staff and services will also enable the project team to create a new initial assessment unit, establish a direct route through from ED to Radiography for urgent CT scans, and make preparations for the development of a new frailty unit which will care for some of the most vulnerable older people. “Emergency care is a critical role for the hospital and because this is always a real pressure area, we have been very careful to involve staff from the department fully in the design of the new ED. 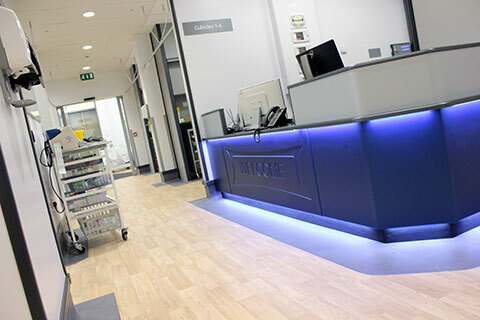 “In a department where mere seconds can really be the difference between life or death, it was vital that we get the layout of the department agreed and equipment sited in ways which will enable our clinicians to do their jobs quickly and effectively. “Now that we’re at a stage where we can move the last cohort of services out into temporary modular buildings, we can get on with delivering the final stages of the Majors area project and ultimately deliver the much improved Emergency Department our staff and patients have been calling for for some time. “I’m really pleased with the way the new Majors area is taking shape. “The four resuscitation bays which we’ll begin to use next week are spacious, smartly designed, and are kitted out with the latest technology; factors which are essential in helping us deliver high quality care to patients in what could well be their time of greatest need. The new Majors area is expected to be fully complete and operational by the end of the year. Click here to view the article on the NHS website.